We'd barely clapped eyes on a single non-flat TV until IFA 2013, but already it seems that anything describing itself as curved is up for ridicule. Understandable, perhaps – it's surely the ultimate gimmick – but Sony has come up with something genuinely interesting that uses its shape in ways other than 'immersive viewing'. The 65-inch Sony KDL-65S995A may be a curved novelty at its core, but it's different to most on show in Berlin because it's based on standard, conventional LCD technology. LED-backlit, of course, the KDL-65S995A carves its own AV niche by offering what Sony calls a Multi Angle Live Speaker. Described as an 'unbelievably clear, powerful surround sound experience', the KDL-65S995A has two speakers on either side of the curved screen that are capable of providing a quasi 4.1-channel array. There are actually six speakers in total, plus two subwoofers, that make up the Multi Angle Live Speaker, which is rated at 40W in total. It's mostly about stereo, of course, with the promised virtual rear sound effects created by Sony's S-Force Front Surround technology. It's perhaps a little disingenuous of Sony to proffer the KDL-65S995A's design as something new. Until around 2005, all flatscreen TVs were fitted with speakers on either side of the screen to provide stereo sound. Those speakers do help make the KDL-65S995A an extraordinarily chunky product. As well as measuring around 10cm in width, the speakers are at least as deep, while the TV itself – when viewed from the side – is nothing short of massive. Not exactly a rear-projection TV, but not far off. That'll be the subwoofers, then. As well as poking out from the front of the TV by about 10cm, the desktop stand's feet curve around the back, further extending the overall depth to about 30cm. You might think that rules out the KDL-65S995A for wall-mounting, but the desktop stand is expendable. Sony was also showing it pinned to a wall with a PS3 hooked-up. Audio innovations are notoriously tricky to appraise on a noisy exhibition floor, but we tracked down the KDL-65S995A in a quiet moment to assess its Multi Angle Live Speaker. The sense of stereo is profound – so much more than your average TV – and the extra dose of power is obvious, but from about two metres from the screen it's the slight surround effect that brings the audio into the room that most impressed. Picture-wise the KDL-65S995A is Full HD, not Ultra HD, so there's an obvious lack of detail when compared to 4K images, but they remain very impressive. A lot less reflective than the curved OLEDs shown by LG and Samsung, the Sony's picture is seemingly unaffected by the curve. Once we were involved in the richly coloured, blur-free pictures and powerful stereo sound, we pretty much forgot all about the curve. You could say that makes the shape pointless in terms of picture quality. The shifting of the speakers slightly nearer to the viewing position is more significant. The KDL-65S995A, which sports a Triluminos display and an X-Reality PRO picture engine, has all the usual high-end Sony goodies, too. There's smart TV apps, Wi-Fi, and NFC tech for 'tap' pairing with Android smartphones and tablets. The KDL-65S995A is available to pre-order now in the USA for $4,000 – about £2,500. 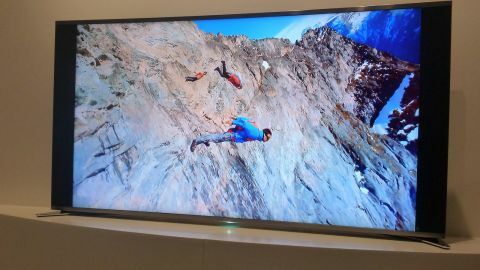 Compare that to the £6,000 Sony charges for its identically sized Ultra HD KD-65X9005A TV, though the KDL-65S995A has only Full HD resolution and lacks a built-in Skype camera. Staff on the Sony stand suggested to us that it would also go on sale in both China and Russia before the end of the year, though no European appearance is confirmed. The KDL-65S995A isn't the only curved LED TV on show at IFA. Samsung is also showing a 65-inch version, though the South Korean company's version is super-slim and has no significant audio innovations. Is this behemoth from Sony the shape of things to come in home cinema? Perhaps not, but this audio-centric, chunky curved TV is at least something different from the sleek and beautiful designs we've already seen at the IFA stands of Samsung and LG. If you're desperate for a curved TV but can't afford to fork-out for – or don't trust – OLED tech, the KDL-65S995A is worth a look and a listen.